Am I wrong to say that Singapore is the next best place to have ramen after Japan? We are so fortunate. 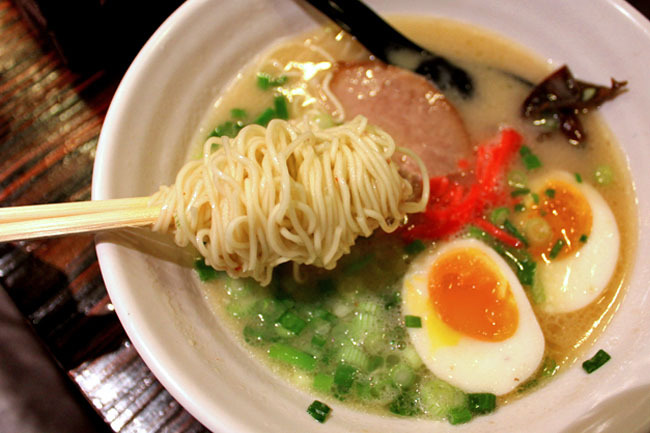 There are so many ramen restaurants in Singapore, with many more new openings in 2012. 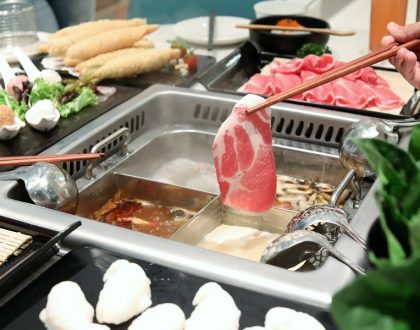 Some of the best ramen places is Singapore has been widely accepted as Ippudo (or Ippudo Tao), Keisuke Tontotsu King, Santouka, Miharu, Daikokuya and Marutama . They are in no particular order and sorry that your favourite is not here. 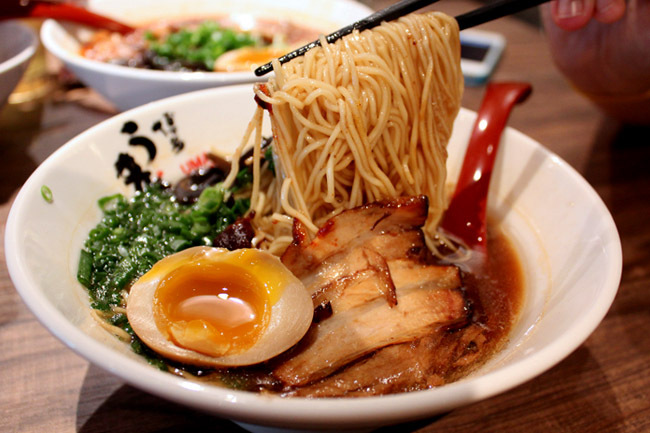 Daniel’s Food Diary, being a ramen fanatic, thinks it is about time to update the list and will attempt to rank 5 new and best ramen places in Singapore, all opened in 2012. Ramen Keisuke Tori King which is just opened at the newly renovated Amara Hotel Shopping Mall has been attracting long queues. 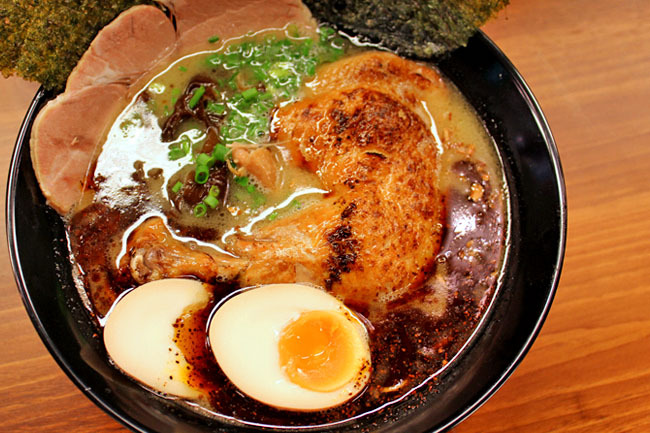 This is the popular Keisuke bringing a spin to the traditional ramen – chicken thigh with chicken stock! My recommendation is the Black Spicy Tori King Ramen Special with All Toppings ($16.90) which includes an amazing tender chicken thigh with a huge slice of pork loin, tamago and seaweed. 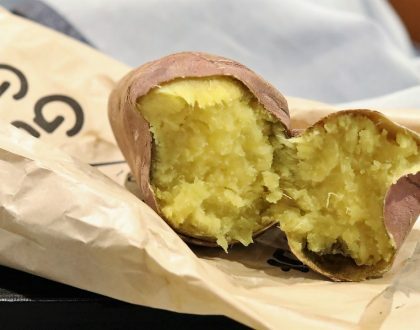 Some people hate this – too big chicken (too big also complain? ), troublesome chicken bone, and ‘strange’ chicken stock, especially with wasabi. Yes, I still prefer the Tontotsu version any time, but this really comes very close in terms of Wow-factor. This ramen bar at Boat Quay would have been easily my Number One if I stopped at my first bowl. My 2nd and 3rd visits were inconsistent both in terms of service and taste. Otherwise their thin straight noodles noodles and warm Tonkotsu broth should appeal to many Singaporeans, and I know many CBD workers swear by this shop. Go during crowded lunchtime and you will know why. My preference is with the jet black ramen ($13.90), with added aroma of garlic and squid ink, tasting more flavourful and varied. Otherwise, go for the Tsukemen flavoured with fish, available in limited quantities. There isn’t very much to choose from as there are only two types of ramen – Uma Uma Ramen ($14) and Spicy Chasiu Ramen ($16). If you like your noodles thin, non-curly and springy (like mee kia, similar to Ippudo’s version), chances are you will enjoy Uma Uma a lot. Not for the Sapporo ramen fans though (ie Ramen Santouka’s version). 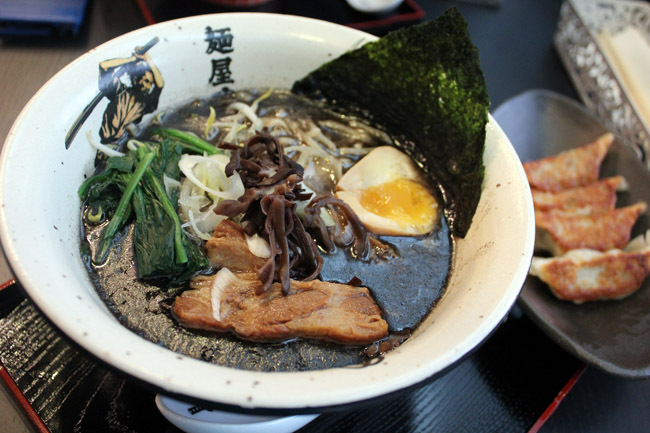 The tonkotsu broth is thick, dark, rich, and salty. On the flipside, the portion (or can I say bowl) is small, and therefore the soup cools down faster than usual, not likely to please those heavy eaters who prefer a fuller meal. Ironically, this is the most authentic ramen shop of the lot – hole in the wall, and real Japanese chefs. 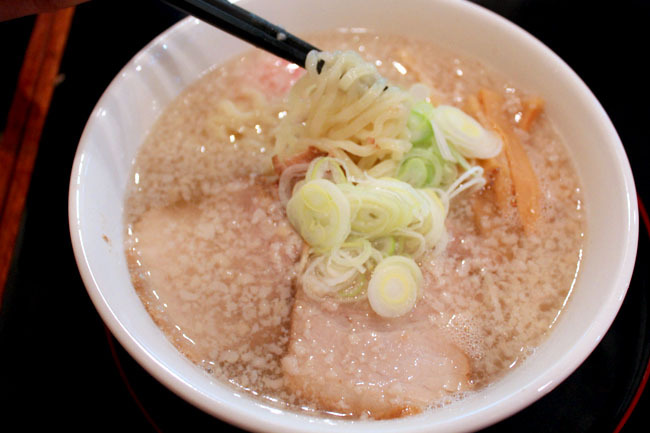 The majority of the ramen are Shio-based, which has a pale and clear broth made with plenty of salt and vegetable. I had the basic Rahmen ($12.00) which arrived with a clear stock with light yellow, slightly thick and curly noodles (which may remind you of instant noodles). Tonkotsu fans who are used to thick, salty and creamy soup bases may get turned off by this version, which is exactly the opposite – thin, simple and plain. There are some other new ramen shops that I tried like Marukin Ramen at Scotts Square, Keishoken at Great World City, Tonkotsu Kazan Ramen at Novena Square 2 and the new stalls at Ramen Champion Changi Airport Terminal 3 which have their own fans as well. 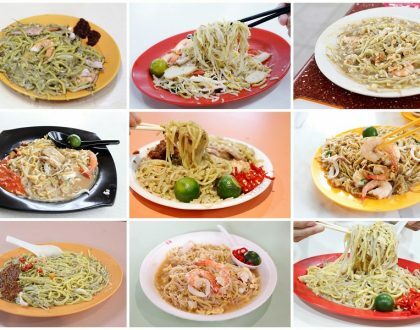 So which do you think is the Best Ramen Newcomer in Singapore 2012? Tanglin not tried. Tried Tonkotsu Kazan Ramen already… emm, didn’t really like it. But I am willing to give it a second chance. 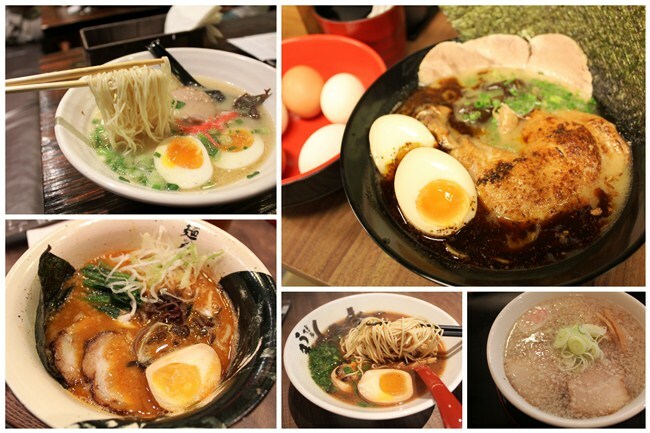 did u try Tonkotsu King Ramen which was next to Tanjong Pagar MRT ? Hi Hugo, yes, the link is somewhere in this post. It was opened a long time ago, so I won’t categorise it as “new”.